A determined burglar returned to the scene of his crime to re-steal a TV, managing to get away with the set while police were still inside the house. Homeowner Steve Fluegge, of Pensacola, Florida, said he surprised a burglar inside his home on the morning of August 28, and the man fled out of the house and through the backyard. 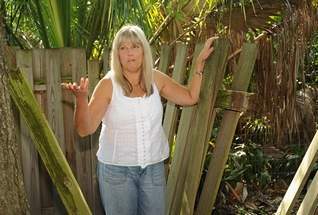 The burglar got away with several items but was forced to leave a 42-inch plasma TV next to the back fence. "We called the police and they were here within just a minute or so," Fluegge said. "There were policemen all over the place." Several police cars and at least one police dog searched the area for more than an hour trying to find the suspect, but eventually lost the trail. Meanwhile, a crime scene technician was working inside the house trying to collect evidence. He had not yet dusted the TV because it was still wet with dew. So he put a tarp over it and waited for it to dry while he worked inside. When he went back out about 45 minutes later, he found only the tarp. "We had no reason to believe the TV would be stolen again," said Capt. Jay Worley. "It looks bad and everything, but there's no way it could have been foreseen that someone could come back and do that." Still, "[t]hey were all very embarrassed," Fluegge said of police, who offered to pay for the TV.